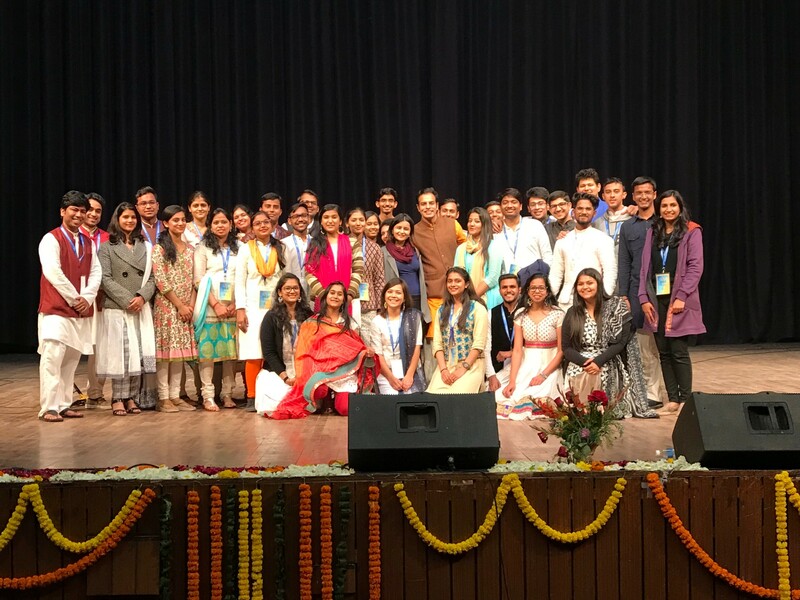 The ‘Sounds of Leadership’ was a one day Youth Conference organised by The Art of Living along with the interns of Netritva Internship of 2018. The aim of this conference was to provide a platform for young motivated individuals to come together to learn and cultivate from thought leaders, changemakers and youth icons across a broad spectrum of industries and interests. It was designed to give young people the unique opportunity to interact with their favourite stars -the real achievers who have struggled, overcome and today are acknowledged leaders in their field, to be inspired by them as they recount their unique experiences. The event saw the participation of 700- 1000 youth. The stellar lineup included remarkable people from various fields. It began with a thought provoking address by Dr. Subramaniam Swamy followed by corporate panel with members as CEO of POP XO Priyanka Gill, Director Amazon Prime Mr Akshay Sahi, Founder Chairman of Kent RO Dr.Mahesh Gupta and CFO of Publicis. Sapient Mr Pawan Talya. This mixed bag of young and old professionals talked of their success, poured out their stories and shared their mantras. Next for the day, we had speaker session by country lead for Talent Acquisition and Campus Ambassador program of Bill and Melinda Foundations Ms Priyanka Khetarpal followed by CEO of Yes Foundation Ms Prerna Langa. Joining us for another speaker session was monk turned politician Mr Mahesh Giri, not only had been previous support for Anand Vihar project but also had one of the most interactive sessions in the conference. Post lunch, Major Surender Poonia took the crowd to astonishment and pride for the nation by sharing inside stories from the army and pouring his heart out on all that it had taught him. To shine a little light on the sports front, we had with us professional boxer and nation’s pride Boxer Vijendra Singh. His one on one candid conversation with our moderator Mr Prateek Khandelwal and an engaging question answer session with the audience took not only the crowd but the organisation team itself to surprise. Next on the list was the captivating, astonishing and interactive session with Textile and I&B Minister Ms Smriti Irani. To motivate the youth and make them realise the power of the unconventional arts we had Filmy Owl’s founder Angel Bedi who talked of her rollercoaster ride of success and failures. To bring it all together and end it with a bang, Stage 2 winner Sharvi Yadav took over the stage along with Kunal, dancing on the rhythm of some Bollywood and devotional music.